Clinical practice guidelines (CPGs) are repositories of high quality medical knowledge. During the past decade and a half, as techniques for distilling clinical knowledge from basic research have improved, data may be gathered efficiently and transformed in a timely basis into useful summaries of the best available evidence. CPGs are the subject of considerable interest in clinical medicine and informatics. Clinicians look to guidelines for credible assistance in resolving problems they face in daily practice. Informaticians view guidelines as a mechanism to overcome the “knowledge acquisition bottleneck,” i.e., the extraction of knowledge from experts in a format that can be processed by computers. Other problems in CPG dissemination include selection of the “best” guideline on a particular topic when “competing” documents for management of common conditions are developed1 and the high cost of CPG development (US guidelines cost on average $100,000–200,0002 and require periodic updating). OpenClinical. OpenClinical: Knowledge Management for Health Care Website; 2008. 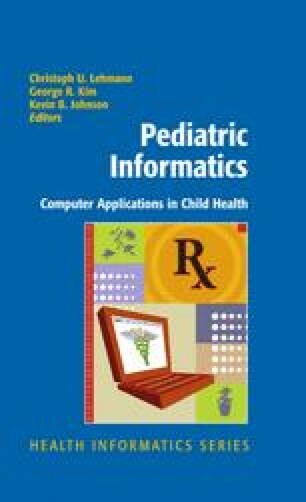 Available at: http://www.openclinical.org. Accessed June 5, 2008. Zynx Health; 2008. Available at: http://www.zynx.com. Accessed June 8, 2008. Yale University. Guideline Elements Model Website; 2008. Available at: http://gem.med.yale. edu/default.htm. Accessed June 5, 2008. American Academy of Pediatrics. AAP Red Book Online; 2008. Available at: http:// aapredbook.aappublications.org/. Accessed June 5, 2008. American Academy of Pediatrics. AAP Policy Website; 2008. Available at: http:// aappolicy.aappublications.org/. Accessed June 5, 2008. American Academy of Pediatrics. Steering Committee on Quality Improvement and Management Steering Committee on Quality Improvement and Management Website; 2008. Available at: http://www.aap.org/visit/scoqim.htm. Accessed June 5, 2008.